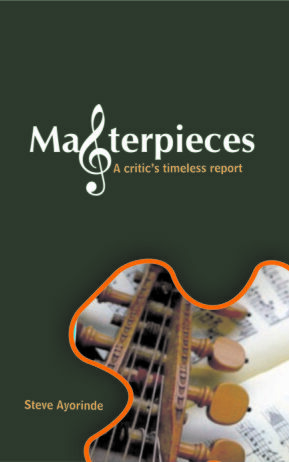 Book review: Masterpieces: A Critic’s Timeless Report / Author: Steve Ayorinde / 2008 / Publisher: Spectrum Books, Ibadan. There must be something inherently present in music that connects to the sensible and spiritual appetite of man. This genre of arts has a way of seeping into the very being of man, most times catching the essence of his rationality, appealing to his longing to relax and be entertained. When I refer to the intellectual capacity of man as a rational creature endowed with reason and the effect of music, I mean songs composed and arranged by musicologists. With due respect, most of what is generally referred to as Naija music hardly meets these standards; at best they can be defined as the amalgamation of some musical notes, but lacking in artistic beauty. If you have any doubts, kindly compare some of the songs by contemporary Nigerian artists, with that arranged by the oldies, like Fela, Osadebe, etc. Masterpieces: A Critic’s Timeless Report, is an unusual book in the sense that it strides across classical music which forms the core of the collection and the critical analysis of this genre of music. A rather ambitious project but yet done with sublime mastery. The author, Steve Ayorinde, took me on an excursion into the not so popular art of the classical music, composed by the masters centuries ago and brought to life in many locations in Nigeria – from the MUSON Centre, Lagos to the Trenchard Hall of the University of Ibadan, to the Camp ground of the Apostolic Faith Church and Deeper Life Ministry. Prior to reading Masterpieces, I knew rather little about classical music. Apart from the few musical concerts I have attended – Autumn Rendition by Irawo University Centre, Ibadan, the Easter/Christmas Concerts by the University of Ibadan Choir and solo presentations by Emeka Osuji – I have never discovered the depth of this music. Ayorinde writes with the ease of a matured writer. He narrates the performances of various artists especially within the recital halls of MUSON with the panache of an aficionado and with the authority of a musicologist, gives a deep critique of the various recitals he attended. Thus, Masterpieces is the fruit of nine years consistent reporting of classical music in Nigeria. “The reviews in this collection, many of which first appeared in The Guardian and later in The Comet and The Punch…” are a testimony of the persistence of a journalist who realises that music – like wine – needs time to mature and be better appreciated by the public. The book is divided into four chapters and an encore (an appendix of national and international Musical Masters, a guide to classical music terminologies). The second chapter, ‘In the Lord’s Vineyard’, can be conveniently renamed ‘In the Apostolic Faith Vineyard’, as it portrays the singular contribution of this church to the renown of classical music in Nigeria. Apart from their unrepentant conductor, who Ayorinde in most essays chided for his showmanship, the church’s annual Easter and Christmas concerts, is an event not to be missed. ‘With Audacity of Genius’ title of the third chapter, goes on to confirm the flagship of MUSON. I think that this chapter should have been placed under the first, there seems to be no great difference between the two. However, this chapter shows classical music is not synonymous with Europe. The other continents were not left on the sideline in this realm of music. Though in chapter one, the author decried the ‘reluctant ovation for African classics.’ The lukewarm reception for the Nigerian instrumentalist who dared to perform in MUSON against all known convention was rather pathetic. Civilisations are made or marred by culture. The great civilisations are those that not only preserve but improve their music, arts and literature. It’s not therefore surprising that the history of the West is marked with invasions which tried to obliterate the very essence of life, seeking to destroy books and alienate music. The Gothic barbarism was a sour line in European history, an unpleasant memory that is better forgotten. At the same time, the flourishing of the Medieval Age can be attributed to a deep Catholic Christian tradition, the womb from which science and culture was conceived. By culture I mean the way of thinking that characterises a civilisation. Although it encompasses the way of life of the people, however it is much more than that. In Masterpieces, one finds it difficult not to notice that most of the classical pieces were at the service of the sacristy. It was therefore not just good music for its sake only; more often than not it had a transcendental purpose. Classical music is therefore a manifestation of an epoch, a cultural patrimony of Europe. Steve Ayoride has rendered a masterpiece, not in musical notes but in words. With a scalpel soaked in ink, he has dissected this body of classical performances with the touch of a maestro. The only regret is that the pictures in the book were neither coloured nor printed in glossy paper. That would have enhanced them a great deal. However, the cover designer deserves special commendation for a splendid book cover. Masterpieces: A Critic’s Timeless Report is not just bonum simpliciter but bonum secundum quid. It is not usually an easy task to collate many essays into a book. This book, though specialised, will appeal to all those who wish to go on an expedition into the high realms of classical music. Reading Masterpieces will either turn you to a convert or enthusiast of classical music. Either way, it’s difficult to remain indifferent.